The K9 Professional mobile grooming van conversion is by far the most popular conversion for mobile groomers. It is loved by groomers and it gives a professional appearance to your customers. Priced at just £11997 ex vat. The K9 Professional grooming van conversion is in a league of its own. Every aspect is designed with you and your clients dog in mind to ensure each groom is that little bit easier, quicker and more profitable. Controls and switches are ergonomically placed, the water heating system is designed to supply you with almost unlimited warm water with minimal input from you, the LED lighting and skylight is placed to give optimium light onto the grooming table and the plug sockets are in the correct place to power your clippers whether you are left or right handed. Each conversion is fitted with our 'K9 Warmline' - fully watertight and insulated gloss fibreglass lining. It fully seals the floor, walls and ceiling protecting your van from the damp environment caused during the grooming process and thus increasing the lifespan of your van. K9 Warmline utilises the latest ultra modern space and weight saving features, which minimizes condensation build up and helps to regulate the temperature in your work area. The K9 HydroExcel Hydrobath is built into a bespoke housing towards the back of the van with all 3 sides of the wash area protected from water spray by full height fibreglass walls. It's not simply a bath bolted into the back of the van. This housing is unique to K9 Professional conversions and is a key feature in keeping the wash area separate from the rest of the equipment in the plant room. This is just one of the features that helps to give a professional image to your customers. All the services like the water tanks, fast heat system, plumbing, pumps, dryer and any options like the vacuum and generator are fitted into the ‘plant room’ at the rear of the van, which is sealed off from the work area to prevent ingress of hair and debris. This keeps the salon a more peaceful space for nervous dogs as the noisier equipment is in a seperate room. Access to this area is by the rear doors. The whole work area and plant room is lit by bright white LED down lighters and separate 12 volt lighting. Natural daylight streams in through the optional skylight and front bulkhead window. Non slip floor of your choice of colour. Bright white LED down lighters and back up lighting. Large fresh water tank with K9's fast heat system. No need to pre-heat. Allbrooks Take-off blaster dryer fitted in the plant room to minimise noise. 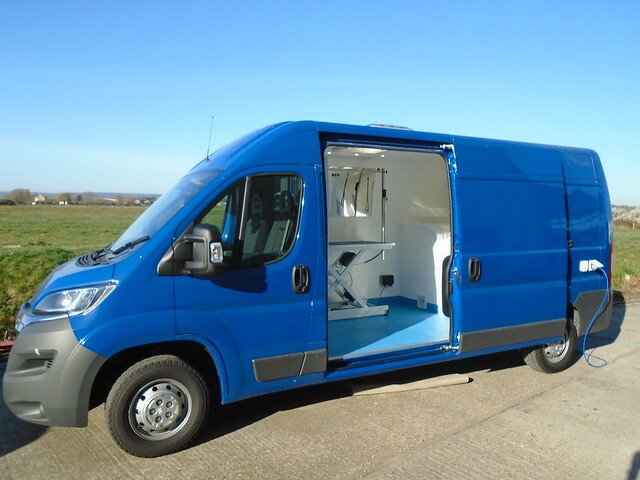 Call us today to arrange a demonstration of our conversions and to see for yourself the benefits of a K9 conversion. Keeping your van clean and tidy is very important and opting for this industrial vacuum will enable you to keep your mobile grooming van spotless at the end of a full days grooming. Professional quality camera system to clearly see whats behind your van when reversing.